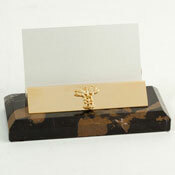 These medical business card holders are designed for physicians and doctors or anyone else in the medical field. They make great gifts for a physician, doctor or medical assistant. These business card holders create a fine professional accent that provides a simple way to hold a doctor business card, for easier access. They can place them on their physician's reception desk or in thier office. They are practical and helpful gifts for doctors and physicians. We feature professional doctor and medical business card holders and doctor business card cases in marble, glass and silver. Each one makes a truly thoughtful and personal gift! Ask us about personalization and discounts on all our doctor business card holders.